Cover the external ground on shielded connectors. Max Cable OD: From 0.217. The innovative Snag Proof Strain Relief is designed specifically to be crimped with the EZ-RJ45® plugs. Two Patent Pending versions are offered for both the Cat5/5e and the Cat6 plugs. The primary strain relief of the plug locks the snag proof strain relief in place so they will not pull off, creating one, integral assembly. Once crimped, this design allows the plug's primary strain relief to relax slightly, preventing the cable pairs from being over compressed. This decrease in stress contributes to achieving peak performance. The tab on the strain relief is designed to extend over the plug's locking tab, making it snag proof when administering patch cords. The new, patented EZ-RJ12/11 Single Connector simplifies twisted pair terminations by allowing the wires to be inserted through the connector and out the front. This allows the technician to easily verify the proper wiring order prior to termination. Use the EZ-RJPRO HD™ Crimp Tool (P/N 100054) for single cycle crimping and trimming of the excess wire. FCC compliant and UL rated. Made in the USA. Patented. For use in telephone & security installations. Faster, easier terminations with reduced scrap. For specialized telephone installations & communications equipment. For applications requiring custom/specific wire configurations. Works on solid or stranded wire. Platinum Tools\' SealSmart Compression Connectors provide simple, fast and reliable terminations. The perfect solution for CATV, DSS, Security, Home Theater and Residential Structured wiring installations. Molded in gasket provides a weather tight seal at cable entry. Single crimp termination with captive center contact design. Universal crimp tool terminates all three SealSmart Connector designs. Use on RG59, RG6 and RG6 Quad shield cables. Connectors are color coded for cable type. RG6 Platinum Tools' SealSmart Compression Connectors provide simple, fast and reliable terminations. The perfect solution for CATV, DSS, Security, Home Theater and Residential Structured wiring installations. Single piece, Platinum Tools' SealSmart Compression Connectors provide simple, fast and reliable terminations. The perfect solution for CATV, DSS, Security, Home Theater and Residential Structured wiring installations. 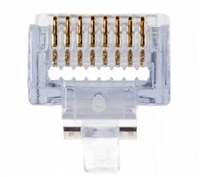 The patented EZ-RJ45® Connector simplifies twisted pair terminations by allowing the wires to be inserted through the connector and out the front. This allows the technician to easily verify the proper wiring order. Electrical performance of the termination is optimized by pulling the connector down over the cable jacket and seating it tightly in the rear of the connector. Reducing the distance between the wire twists and contacts improves performance! Reduces scrap, no wasted crimps. More reliable, higher performance. Crimp with the patented EZ-RJ45 Crimp Tool...crimps and trims in one cycle. Manufactured in the USA. Patented. Simple one piece design...no bars or liners. 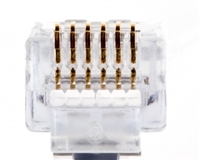 The new patented EZ-RJ45 CAT6 Single Connector simplifies twisted pair terminations by allowing the wires to be inserted through the connector and out the front. This allows the technician to easily verify the proper wiring order. Electrical performance of the termination is optimized by pulling the connector down over the cable jacket and seating it tightly in the rear of the connector. By reducing the distance between the wire twists and contacts, performance is optimized! Crimp with the patented EZ-RJ45 Crimp Tool... crimps and trims in one cycle. (See Part Number 100 004 or 100 054 EZ-RJPRO HD). Manufactured in the USA. Patented. For use in CAT6 compliant data networks. EZ to verify wire sequence. Simple one piece design...no bars or liners. Faster terminations with reduced scrap. RCA MALE RG59 SINGLE Platinum Tools' SealSmart Compression Connectors provide simple, fast and reliable terminations. The perfect solution for CATV, DSS, Security, Home Theater and Residential Structured wiring installations.